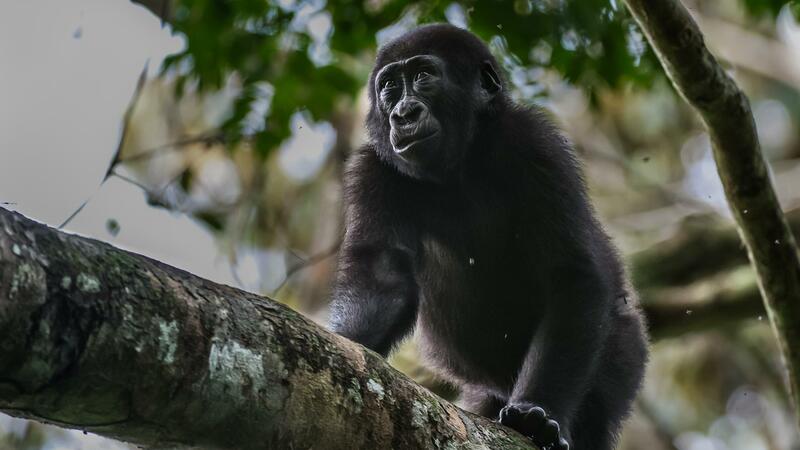 Odzala-Kokoua is one of the world’s remaining large intact forest systems, home to thousands of forest elephant and the critically endangered western lowland gorilla. Odzala is one of the most botanically diverse areas in the world, with more than 4,400 plant species recorded, including distinctive groves of Senegal date palm which are dotted along the Mambili River banks. The southern part of the park is predominantly savannah-forest mosaic and forest galley ecosystem. The centre is dominated by marantaceae forest, while further north, the park is covered by mature rain forest. Numerous clearings, called ‘baies’ provide opportunities to observe wildlife more clearly than the dense vegetation of the tropical forest. The Ekoutou escarpment (80 km²) with its lichen forest, and Djoua swamp in the north-west of the park, remain some of the most remote areas in which only a few scientific expeditions have been conducted. Odzala’s biodiversity is nothing less than exceptional, with more than 400 bird species, it has been recognised as an Important Bird Area by Birdlife International. It is also home to 114 mammal species and in excess of 4,400 varieties of plants. While it is best known for its gorilla and chimpanzee populations, there are numerous other species resident in the park, including thousands of forest elephant. Forest elephant and buffalo are found in the forests of Odzala, along with healthy populations of bongo antelope, sitatunga, bushbuck, giant forest hog and red river hog, numerous duiker species from the large yellow-backed duiker to the tiny Bates’s pygmy antelope and many others species, too numerous to mention. The western lowland gorilla and chimpanzee are amongst the most well-known, but other noteworthy primate species include the black and white colobus, two species of mangabey and the De Brazza’s monkey. Odzala is best-known for its population of western lowland gorilla. Odzala is the only place in the greater Tridom areas where spotted hyaena can still be found. Also home to numerous cat species, including golden cat in two different colour phases and serval in three different colour phases. Three species of pangolin (including the giant pangolin) and aardvark are resident in Odzala. A total of 444 avian species. Among these are the grey parrot, which occurs abundantly in roosts comprising thousands of individuals. Other notable species include the grey-necked rockfowl, forest swallow, Zenker’s honeyguide, Gosling’s apali, black-eared ground thrush, grey ground thrush, eastern wattled cuckoo-shrike, Verreaux’s batis, Bates’ weaver, yellow-capped weaver and Rachel’s malimbe. The park has at least 26 endemic butterfly species. More than 346 species recorded within the boundaries of the park, with an additional 301 recorded in the periphery of the park. At least 26 butterfly species are believed to be endemic to the area and 2005 saw the discovery of a new species, Bebearia ivindoensis. While the Tridom areas supports the largest forest elephant population in Central Africa, the species is under threat as a result of poaching pressure. Many elephant were killed before African Parks took over the management of the park, but effective law enforcement has resulted in many of the remaining individuals moving back into the park area. Gorilla numbers have also declined over the last decade due to the fatal Ebola epidemic which devastated the park since 2004. It is however hoped that with the increased security of the park, this downward trend can be reversed. The park provides safe harbour for approximately 22,000 western lowland gorillas. Threatened birds included the black-casqued and Bycanistes species of hornbill, both of which are considered vulnerable, as well as several raptors such as the crowned hawk eagle. Given the density of the rain forest in which Odzala is located, it can be difficult to view gorillas outside the baie areas where they have not been habituated, as they disappear at the slightest sign of human presence. As the gorilla experience is an important element of the park’s tourism appeal, a number of sites have been identified, and the research and monitoring team, have selected gorillas for habitation through careful monitoring and observation of their temperament and behaviour. It is hoped to habituate at least three groups of gorillas, which will take between three and five years.